really holds a lot of truth. Unquestionably spiders are feared by most everyone I know, but is a result from media-driven hype, anxiety-filled public hearsay and made worse yet by medical misdiagnoses. As a Pest Control Operator for the past 32 years and an Entomologist, the fear is more of a situation of psychological problem than an entomological one. Spider bites are extremely rare, so it doesn’t come from known numbers of cases being reported, but more from what people believe to be true based on more of what they have heard, rather than what they have seen or personally experience. Assumed risk is greater than the actual risk they pose. I’d bet the harm from untrained use of pesticide actually is worse than any harm from spiders. Spiders are beneficial pest! Let me say that again, they are beneficial. They help reduce the population of other vector of disease (flies, mosquitoes and cockroaches) which are far more a concern than spiders. If you must control them, a few things you need to know to better meet realistic expectations. Spiders by nature are very difficult to control and eliminate 100% of any given population because they can enter properties by what is referred to as ballooning. They will spin a web between their legs and “parasail” from higher vegetation never crossing a treated area. They are a high bodied insect, so it isn’t likely that they pick up enough pesticide to control them. Most spiders are nocturnal and unless you can treat them directly, you will have some level of population on any given property, even the day after treatment. It’s well documented that there are NO brown recluse spiders in California, yet I receive calls almost every week that people have them, seen them, know someone that has been bit by them, and oh yeah, even their doctor said the “bite” was a brown recluse spider. Thanks to the media hype for instilling “if they say so, it must be so”. We just don’t have them. Spiders are our friends and play a crucial roll in the balance of pests. So what spider do we have that hold a potential risk of harm? Two spiders come to mind, Black Widow and the Brown Widow. Before antivenom were available, bites from these spiders caused death in about 5% of the cases. Because of modern medical treatment, death is almost non-existent. The fact is no suspected wound should be blamed on any spider unless you actually pull one off of you in the act. A good portion of our inspections are for what we call Mystery Pest, or No-Seeums. 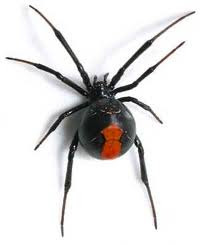 “ I woke up this morning and I had spider bites all over” Maybe if you were on the set of a horror movie like arachnophobia or some other creepy crawler movie, but being bit in bed is highly unlikely from any spider, including a black widow. Far more of a chance that these “bites” are a result of multidrug-resistant Staphylococcus aureus ( MRSA). Spiders do not seek out people to bite; in fact most bites reported are of an accidental nature. The practice of leaving your gardening shoes on the back porch is one example. Spiders will crawl in them if they sit outdoors. Bottom line, spiders play an important role in the control of pest in our environment, so the next time you see a spider in your garden remember they’re working overtime to help keep the bad bugs away.